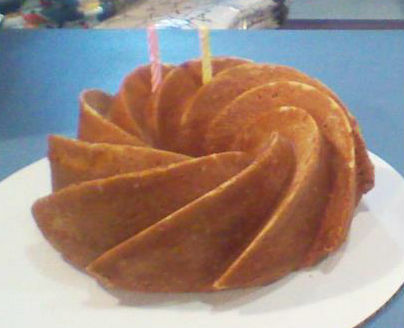 Our own Liana made this fabulous pound cake in Nordic Ware’s Heritage Bundt Pan for a staff members’ birthday! It’s July – the sun is shining, the grills are burning, the fireworks are bursting, and people all around the country are celebrating America. We’re excited to join the celebration by featuring American companies and products all month long. It’s Made-in-the-USA Month at Fante’s Kitchen Shop. This week, we’re kicking it off with a tribute to one of our favorite American companies, Nordic Ware, creators of the classic Bundt pan. The aluminum Bundt was trademarked in 1950 by Nordic Ware founder H. David Dalquist. Decorative ring-shaped cakes were very popular among German, Austrian, and Hungarian immigrants and their descendents, but their ceramic forms were very fragile, and the cast-iron forms very heavy. At the request of a local chapter of the Hadassah Society, Dalquist developed the modern-day Bundt pan, using lightweight aluminum. This style baking pan has since grown exponentially in popularity; to date, Nordic Ware has sold over 50 million. And the company has remained true to its roots, manufacturing its products in America for over 60 years. The above Heritage Bundt is only one of a large variety by Nordic Ware. One of our favorites is the 9-Cup Quartet Bundt Pan, at left. After all, what could possibly be cuter than mini Bundts? Use one large recipe to make four of the same cake, or try out multiple recipes of 2¼-cups each. These beautiful Bundts make a picture-perfect presentation for any holiday event. You know where to go for the pan – are you wondering what to fill it with? We have one idea! Longtime staff member Maria shared this pound cake recipe with us years ago, and we’ve been using ever since. Ingredients should be at room temperature before mixing. In a large bowl, cream the butter and sugar. Add the eggs and milk. Mix well. On the side, combine the flour and baking powder. Add the mixture slowly to the batter. Add the flavors. Mix for 20 minutes or more until batter is smooth and creamy. Bake for one hour or until your Cake Tester comes out clean. For a double batch, bake for an hour and a half or until tester comes out clean. Invert onto a rack to cool before serving. 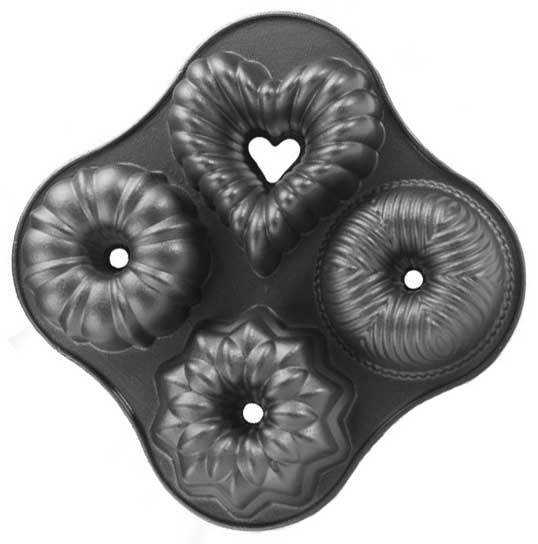 Though Nordic Ware is best known for their bundt pans, the company sells many other baking wares. One of their newest is the Cake Pops Pan. While cake pops can be made by crumbling up a baked cake, adding frosting, and rolling the mixture into balls, the Nordic Ware Cake Pops Pan makes it easy to bake the batter into a ball right off the bat. The shapes are cleaner and the cakes are easier to dip and decorate. It’s the best way around to make a cake on a stick! The pan consists of two pieces with a locking mechanism on the sides. Fill the bottom half of the pan partway with batter, lock on the top half (which has holes at the tip of each sphere), then bake. After the cake balls have cooled, slip a lollipop stick into the hole at the top of the pan and decorate as you see fit. Most people dip them in chocolate and sprinkles, but the possibilities are endless. Use your imagination! This Saturday, from 11 to 3, we’re very excited to have Liz and Paul from Nordic Ware, who will be sharing their baked goodies with everyone who ventures out in the hot hot heat. Stop by the store to chat with them about Nordic Ware, the perfect Bundt cake, and anything else! As part of their visit, Liz and Paul will be giving away free copies of Nordic Ware’s Bundt cake cookbook. There’s no better source for Bundt cake recipes out there! Finally, while you’re here, make sure to enter our giveaway drawing for a free Heritage Bundt Pan – sure to turn your Bundt into a home run! Come down to the store and enter your name for a chance to win. Next Saturday, we’ll be focusing on Ball mason jars as we welcome Marisa McClellan, author of Food in Jars, who will be here to sign copies of her brand-new book. Stay tuned for more American-made products throughout July!